In the previous step we checked out MODIS install. The key here is making sure that .MODIS_Opts.R has the correct values and is copied the right location. Every time you load MODIS ( library(MODIS)), the current version of .MODIS_Opt.R will be loaded and those defaults will be used for all your processing. Ok all suggested packages are installed! MRT enabled, settings are fine! OK, GDAL 1.9.2, released 2012/10/08 found! After the last command you should see a listing of all your MODIS options settings. 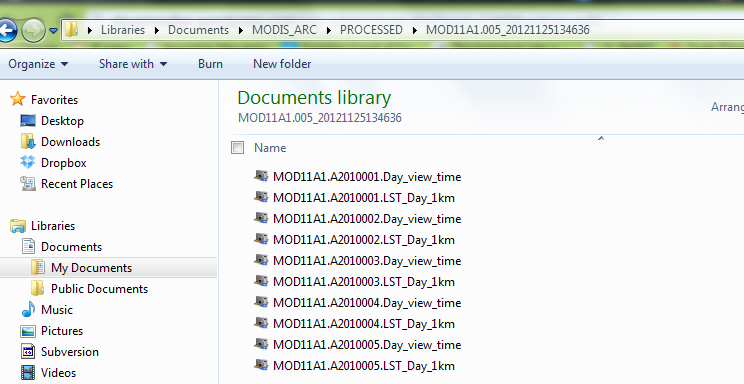 For now these are controlled by the file .MODIS_Opts.R. If you want to change the organization of your files there is a command to do that “orgStruc()”. This command allows you to move an entire directory structure to a new location. Before we play with that command, we will need to get some files. A first attempt at getting files. For this we will use runGDAL(). This command will create the local archive, download hdf files to it and run a gdal process on those file creating processed output. for brevity I’ve shortend some of the output. This is taken straight from the sample code. No output ‘pixelSize’ specified, input size used! Downloaded by the first try! As you watch this command execute you will also see output from the “GDAL” process. That will look like this. if you dont see this output, then your path to GDAL is messed up. ( ha, I messed mine up ) make sure your FWToolspath in MODIS_Opts.R is set to the right location. I have both FWTools and OSGeo4W on my system and I set FWTools to the OSGeo4w version of GDal. Creating output file that is 891P x 307L. Using internal nodata values (eg. 0) for image HDF4_EOS:EOS_GRID:C:\Users\steve\DOCUME~1\MODIS_~1\MODIS\MOD11A1.005\201001~1.05\MOD11A~1.HDF:MODIS_Grid_Daily_1km_LST:LST_Day_1km. Using internal nodata values (eg. 0) for image HDF4_EOS:EOS_GRID:C:\Users\steve\DOCUME~1\MODIS_~1\MODIS\MOD11A1.005\201001~1.05\MOD11A~2.HDF:MODIS_Grid_Daily_1km_LST:LST_Day_1km. Using internal nodata values (eg. 255) for image HDF4_EOS:EOS_GRID:C:\Users\steve\DOCUME~1\MODIS_~1\MODIS\MOD11A1.005\201001~1.05\MOD11A~1.HDF:MODIS_Grid_Daily_1km_LST:Day_view_time. Using internal nodata values (eg. 255) for image HDF4_EOS:EOS_GRID:C:\Users\steve\DOCUME~1\MODIS_~1\MODIS\MOD11A1.005\201001~1.05\MOD11A~2.HDF:MODIS_Grid_Daily_1km_LST:Day_view_time. Before I explain the runGdal() command and all its options, we want to make sure that the process worked. Your local modis archive should be easy to find. 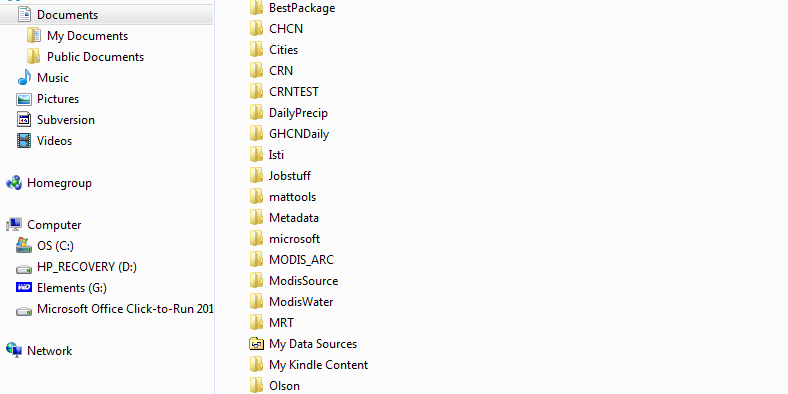 Mine is in my R Home directory. Many thanks for this tutorial. It is a real help for installing the MODIS package. I am going to follow your blog closely for more useful posts. If I have anything to contribute in the way of example scripts I am happy to share them with you in the future. great tutorial, thanks a lot. I followed your steps but run into a problem with the MODIS_Opts.R gdalpath. OK, GDAL 1.7.3, released 2010/11/10 found! GDAL : disabled. Use ‘MODIS:::checkTools(‘GDAL’)’ for more information! Any idea where it is going wrong? Hi. Really a thorough guide, thanks. I can’t look for MODIS pakage on CRAN, there is only a MODISTools. They are same? Hey Steve, thanks so much for writing this tutorial. OK, GDAL 1.11.3, released 2015/09/16 found! Hi, I have the same problem with gdal. I tried MODISOPTIONS() and let the paths create for outputs. Then I tried again and it worked.